The following is a list of notable historical maps of Dublin City and County Dublin, Ireland. 1610 Dubline John Speed Size 21cm x 18 cm. 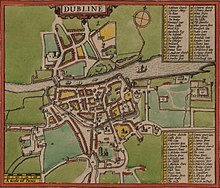 1673 The city and suburbs of Dublin, from Kilmainham to Rings-End werein the rivers, streets, lanes, alleys, churches, gates & c. are exactly described Bernard de Gomme Scale 1760 yards to 1 English mile. 1756 Exact survey of the city and suburbs of Dublin John Rocque Produced on 4 sheets, each 705x495 mm. Scale 1:2400. Revised edition in 1773. 1757 A Survey of the city harbour and environs of Dublin John Rocque Size: 972 x 1390 W: 1008 x 1396. 1764 Plan De La Ville De Dublin Jacques-Nicholas Bellin Published by Le Petit Atlas Maritime. 1767 Exact survey of the city and suburbs of Dublin Published by Peter Wilson Size 34cm x 23 cm. Scale of British feet 3 cm to 1000 feet. Published by Peter Wilson of Dame Street. 1780 Pool and Cash's Dublin Robert Pool and John Cash Panorama view of Dublin. 1797 Plan of Greater Dublin including Circular Roads Engraved by Samuel John Neele. Published by: William Faden. Plan of the city of Dublin as surveyed for the use of the Divisional Justices to which have been added plans of the canal. Engraved by S. J. Neele, 52, Strand. Published by: W. Faden, Geographer to the King, Charing Cross, 2 January 1797. Sold by: W. Allen & J. Archer, Dublin. 1816 Taylor's Environs of Dublin John Taylor Scale 2 inches to 1 mile. 1821 Maps of the county of Dublin William Duncan 8 sheets. Duncan was commissioned by the Dublin Grand Jury to produce a set of maps of Dublin for administrative and planning uses. 1836 Dublin Street Directory Map with engravings of the principal buildings in Dublin Published by Baldwin & Cradock of SDUK Published under the superintendence of the Society of the Diffusion of Useful Knowledge. Colour map. 1837 Dublin Environs Drawn by B. R. Davies. Published by SDUK Published under the superintendence of the Society of the Diffusion of Useful Knowledge. 1843 Ordnance Survey 6-inch First Edition Ordnance Survey Scale 6 inches to 1 mile. 1880 Ordnance Survey Map of the City and its Environs Ordnance Survey Constructed for Thom's Almanac and Official Directory. Printed and published by Alexander Thom, 87 & 88 Abbey Street, Dublin. Under direction of Lt Colonel Martin. Scale 6 inches to 1 mile. 1885 Environs of Dublin By Edward Weller F.R.G.S. 1895 Bacon's Large Scale Plan of Dublin for Cyclists and Tourists Published by G.W. Bacon and Co., London Size 82cm x 70 cm. Scale 6" : 1 mile. Publish by company of George Washington Bacon (1830–1922). 1906–9 Ordnance Survey 25-inch Second Edition Ordnance Survey Scale 1:2500 (c.25 inches to 1 mile). http://gis.sdublincoco.ie/historical_mapping/ – South Dunblin CoCo area – online maps for Roque (1760), Taylor (1816), Duncan (1821), First Edition OS Maps (1843), Third Edition OS Maps (1911–12), Fourth Edition OS Maps (1935–38), GSGS 3906 (1940) and GSGS 4136 (1942). Maps of Dublin accompanying Thom's Official Directory, printed by the Ordnance Survey for the Dublin publisher Alexander Thom from the six-inch map sheets 18 and 22, and dating from the late 19th century. A UCD Digital Library Collection. This page was last edited on 26 January 2019, at 10:10 (UTC).